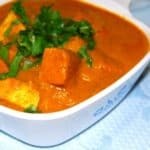 An appetizing plate of Tofu Tikka Masala is all I really need for the perfect Sunday night dinner. The tofu is baked and then simmered in a spicy, tangy sauce of tomatoes and onions. 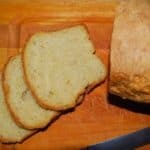 Serve with brown rice or an Indian flatbread like naan. This is the kind of food Desi and I love to eat on date nights in, usually Sunday nights. Jay’s already in bed so he’s nice and rested for school, the dogs are too tired to make too many demands, and the cat is grooming himself on his cat tree, taking an occasional break to peer into the dark night outside the window. Fact is, I despise Sunday nights. It’s still the weekend, but Monday’s so close, with all the drudgery of the work week ahead. 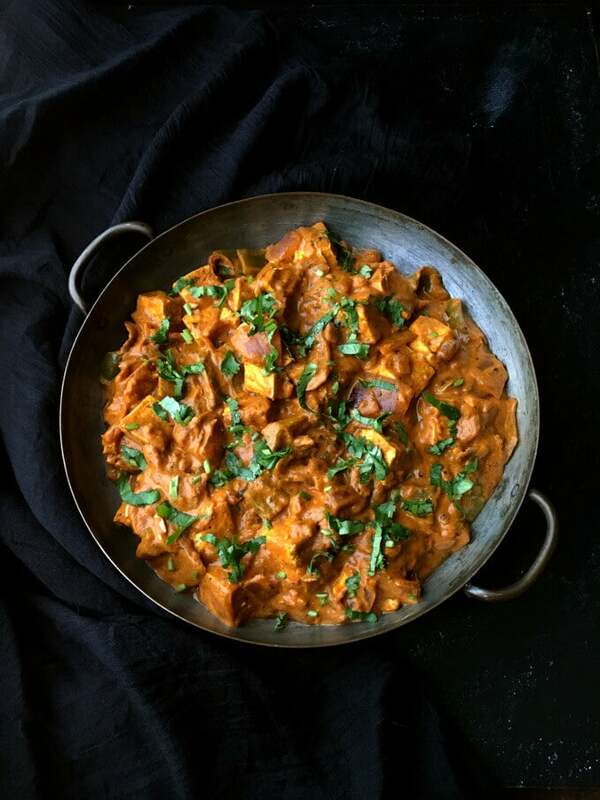 It’s hard to feel cheerful, but with Desi for company, a glass of wine, a Brit murder mystery, and something like this Tofu Tikka Masala on the menu, I can set myself up for an evening with no dread of what tomorrow will bring. 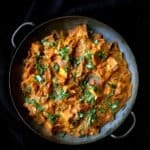 What I really love about this Tofu Tikka Masala is that it is so versatile. 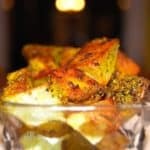 I can serve it with a very simple rice pilaf, or, if I am feeling like some extra cooking, with a fluffy, soft naan. And it is not a complicated dish, so after a day of running errands or meeting friends, I can get it done well in time to get Jay fed and off to bed, leaving me enough time to snuggle with my sweetie. 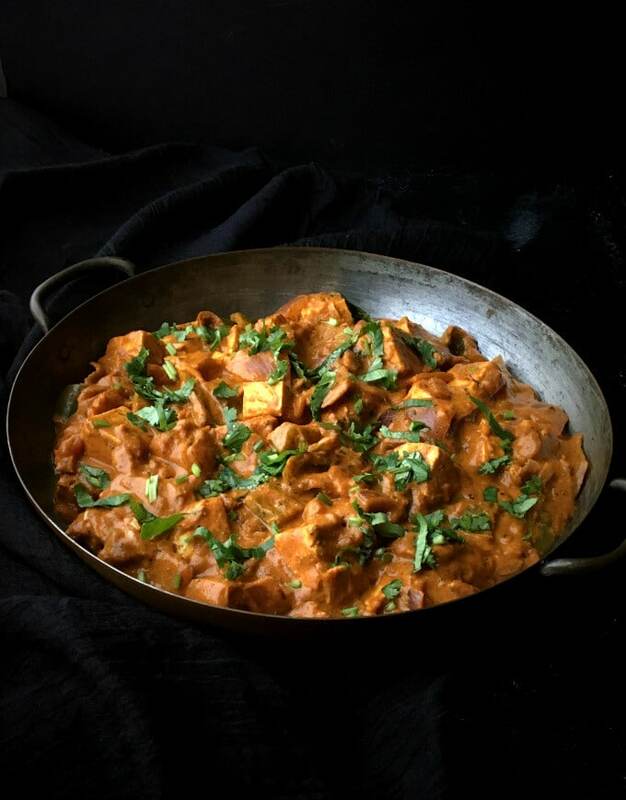 What I also love about this Tofu Tikka Masala is that it is so delicious. 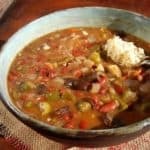 The sauce is creamy and tangy and spicy but not hot or overbearing. The tofu, baked until it’s chewy outside and soft on the inside, soaks up all of the flavors and becomes a delicious entity on its own. And if I don’t feel like making another vegetable side, I don’t have to sweat it, because there already are plenty of veggies in this dish. 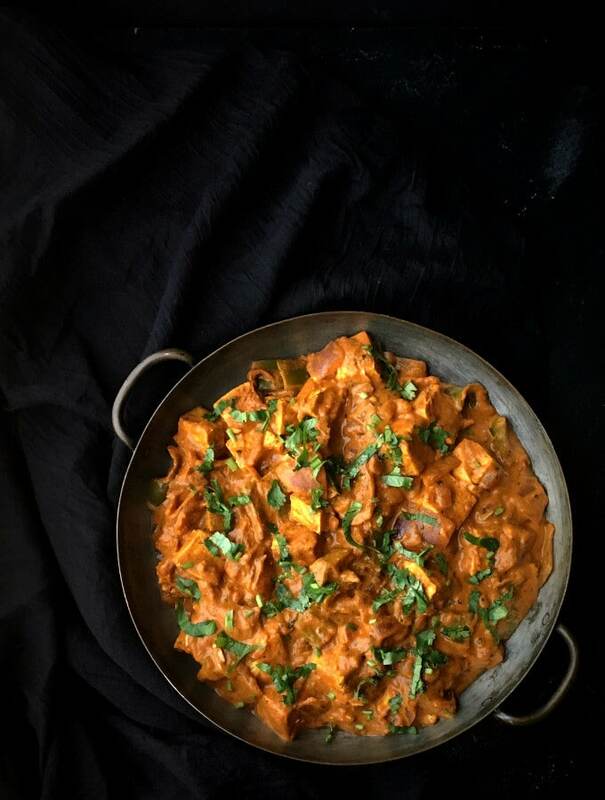 An interesting fact about tikka masala is that as much as it sounds like — and is sometimes identified with — Indian cuisine, it is in fact no more Indian than curry powder or balti cuisine are. 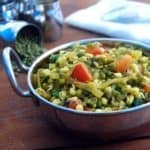 Instead, it is a dish created entirely on British soil by residents of Indian origin, who, one can only imagine, were desperate to feed their fire-loving palates with something more vibrant than kedgeree (also a British spin-off of an Indian dish). 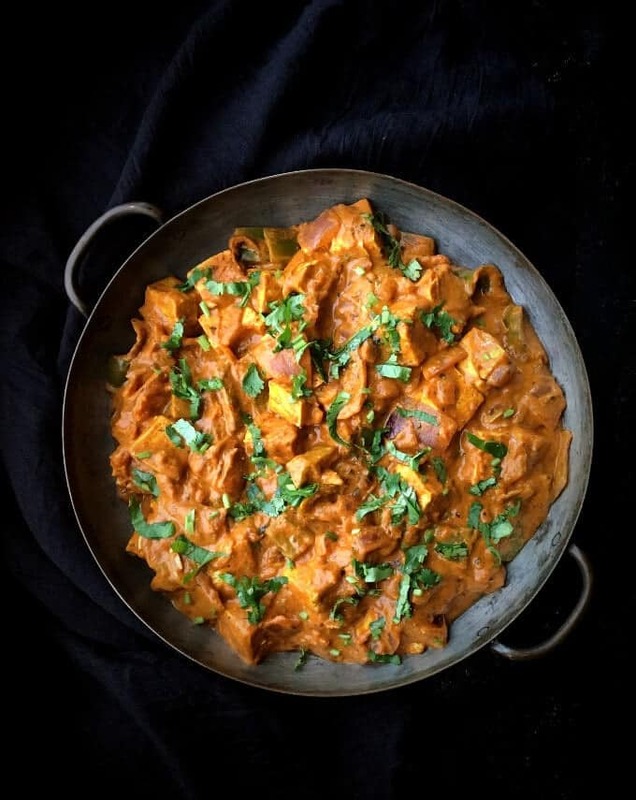 Today, tikka masala is to be found in restaurants the world over, although it usually includes a meat like chicken and, occasionally, the Indian cheese, paneer. The sauce also includes yogurt. I have eaten them all, in my past life, but I can swear that nothing tastes as good as this very vegan version. So if you’re looking for a recipe to make tonight, try this. Or try it even if you aren’t. And then put up your feet and feel those Sunday night blues melt away. 1 14-oz packet of extra-firm tofu. Swaddle the tofu brick in paper towels and place in a colander. Place a heavy weight, like a pot, on top, and set aside for an hour at least to squeeze out the water from the tofu. Cut the tofu into six pieces and set aside. Preheat the oven to 400 degrees Fahrenheit. 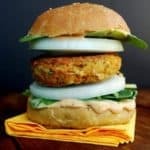 In an oven-safe dish, make the tofu marinade by mixing together the coconut milk, ginger-garlic paste, coriander powder, cumin powder, garam masala, lemon juice, paprika, half the kasoori methi, and turmeric. Pour out half the marinade into another oven-safe dish. Place the bell pepper chunks and half the onion chopped into 1-inch chunks in one of the oven-safe dishes, and the tofu in the other. Turn the tofu around to coat with the marinade. Toss the vegetables in the other dish with the marinade to coat the veggies evenly. 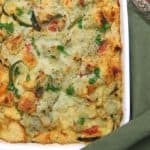 Now place both dishes into a preheated oven and bake for 30 minutes or until the tops of the veggies start to brown. Turn the tofu around once halfway through baking. While the tofu and veggies are baking, blend the tomatoes and the raw cashews with 1/2 cup of water into a smooth paste. Heat the oil in a large saucepan. Add the finely diced onions and saute for about 8-10 minutes over medium high heat until the onions turn golden-brown. Add the tomato-cashew puree and cover and cook for 20 minutes. If the mixture gets too dry, add 1/2 cup water. Add the baked veggies and remaining kasoori methi to the tomato sauce and stir well to mix. If there's any marinade sticking to the dish, pour it into the saucepan, adding some water to the dish if needed. Add the tofu to the sauce and again, pour in any marinade, using a little water to release any that is stuck to the dish. 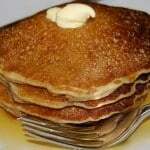 Add the sugar or maple syrup, if using. I like this because it rounds out the various flavors in the dish without making it sweet. You want the sauce to be creamy but not watery. If your sauce appears too dry, add some water or vegetable stock. Bring to a boil, add salt, and turn off the heat. Garnish with coriander leaves. Serve hot with rice or naan. For an even quicker way to enjoy this dish, try making my jarred Curry Paste for Tikka Masala which is quite the lifesaver on busy nights when you want a great meal on the fly. For luck, try this Black Eyed Peas Tikka Masala. Or, for a quirky take on a traditional favorite, try my Tikka Masala Pot Pie. Looks amazing and I can’t wait to make this. I have all the ingredients, lucky me! Wow !!! Love the idea of vegan families 🙂 stay blessed !!! I tried this out. Very easy to follow instructions. But the flavor was a little bland for us. Next time I would add some green chilies and some pepper. But I loved the color and the texture of the gravy. I would also suggest dry frying the tofu instead of baking it in the oven. Thanks for letting me experiment with an all time favorite dish – vegan style! 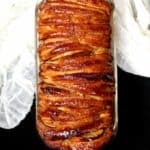 This recipe is amazing. 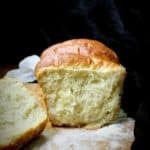 I made a big batch for family over the holidays and it was gone in minutes. Even the kids loved it. Thank you! So happy you liked it, Meena.